Hubert Damisch, 'L'œil théoricien', translated from the French by Anthony Auerbach. Translator’s note: The following article was published on the occasion of an exhibition of works by Josef Albers (1888–1976) in a small town in northern France in the centenary year of the artist’s birth. Tourcoing had recently become the twin town of Bottrop, Albers’ birthplace in the Ruhr region of Germany and home of the Josef Albers Museum, the principal lender to the exhibition. Hence the unlikely venue for the meeting of an artist whose career spanned the vicissitudes of modernism, first in Europe, then in America, and Hubert Damisch (1928–), an art historian who has helped define the scope of his discipline. Both—the one in painting, the other in writing—issue a challenge to art history, its theories, its methods and their limitations. Albers insisted theory comes after painting, from trial and error. 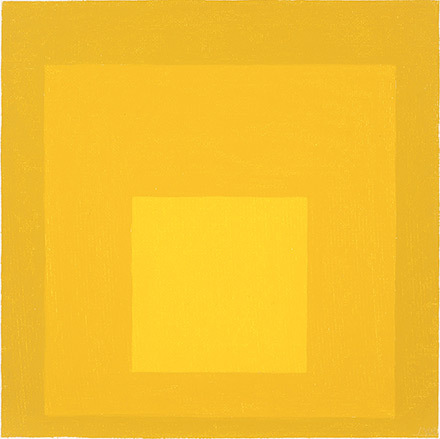 For Albers, the work of art was indeed thinking, and painting a situation to think in. For Damisch, writing traces thinking in painting, works it out, weaves with its threads a text, a theorem. In the essay on Albers, Damisch approaches not only his object but also his instrument, in so far as Damisch thinks through Albers. For Damisch, moreover, art history means thinking through what comes after, that is to say, theory. Original publication: Hubert Damisch, ‘L’œil théoricien’ in: Josef Albers, Tourcoing: Musée des Beaux Arts, 1988, 11–17, catalogue of the exhibition curated by Evelyne-Dorothée Allemand, held at the Musée des Beaux Arts, Tourcoing, 30 January–3 April 1988. References to the relevant English publications are provided. The translator’s additions to Damisch’s notes are indicated with square brackets. Damisch's article did not include specific references to the works illustrated in the exhibition catalogue. A few illustrations of Albers’ work have been added. I am grateful to Hubert Damisch for his permission to publish this translation and to Teri Wehn-Damisch for her kind assistance. I would like to thank Brenda Danilowitz, Chief Curator of the Josef and Anni Albers Foundation, for helping with material from the Foundation’s archive and the images presented with this text. This translation was first made for a seminar at Jan van Eyck Academie in 2008. It is published in the Journal of Art Historiography, no. 5, December 2011. Figure 2: Josef Albers, Study for Homage to the Square, 1966. Oil on masonite, 40.6 x 40.6 cm: private collection. Copyright: The Josef and Anni Albers Foundation (1976.1.187). The eye, the most theoretical of all the senses. Contrary to received opinion, Freud’s respect for artistic types was not unqualified. ‘Meaning is but little with these men, all they care [for] is line, shape, agreement of contours. They are given up to the Lustprinzip.’ [note 2] This judgement, reported by Ernest Jones, does not necessarily belie the interest the founder of psychoanalysis showed in artists such as Leonardo da Vinci, Michelangelo and even Signorelli, who enjoy a truly exceptional status in our culture. The nuance of contempt it implies (that seemed to justify the fascination with ‘pure visibility’ among the German aestheticians of the end of the [nineteenth] century that Benedetto Croce denounced around the same time) could just as well go hand in hand with a poorly disguised envy. Neither Leonardo’s personality, the Orvieto frescos, nor the figure of Moses would have held Freud’s attention for long, or awoken in him an echo, be it unconscious, were it not for the enigma which they posed to him. An enigma which was not a matter of lines, forms or contours (as for colour, Freud did not breathe a word about it in his letter to Jones), but whose scope was measured out for him in terms of meaning [signification], and moreover in terms of the Reality Principle, in so far as it was [an enigma] susceptible of interfering with his own history, his own past, his own obsessions, his own neurosis. Josef Albers is without any doubt, among modern artists, the one who would seem to correspond the best, the most explicitly, the most deliberately, with Freud’s characterisation: disregarding every consideration of representation or of expression, did not this artist, usually seen as the product par excellence of Bauhaus ideology, set himself the programme of working, as both painter and teacher, on the development of a veritable, but strictly experimental, culture of the eye, supposed to lead, as he said about colour, to an increase of pleasure [un plus de plaisir] (‘its greatest excitement’ [note 3]), beyond received rules and canons? [note 4] To this end, a good part of Albers’ work, and still more of his teaching, was brought to bear precisely on colour considered in and for itself. But the neglect of colour among the formal components of art would not be surprising on the part of someone like Freud, who always insisted, not without some complacency, indeed with a barely hidden feeling of superiority, that he was not, himself, a ‘visual’ type and that words were his natural element. Albers could well hold, in his pedagogical work on colour, to apparently empirical procedures, founded on trial and error. Doubts about the basis of his teaching, and the various forms of resistance which were aroused among his students by the experiments to which he subjected them, convinced Albers very early on that the preferences that everyone shows for some colours and the aversion others can produce, beyond being an obstacle to the just appreciation of the relations of value or intensity between various tones, are underwritten in the register of the drives. At the beginning of the year, when he happened to observe the repugnance that a student experienced in working with a certain colour, he did not hesitate to force the student to work with that colour systematically until the hatred turned to love, which never failed to happen. [note 5] There is a comparable note of mischief in such a method of teaching and in an art that is essentially cunning. But, if ruse there is, in this case, it owes nothing to dissimulation—painting making its whole operation visible—and anticipates more long-term effects, but also more profound effects than could be attained simply by formal exercises: effects which suffice to confer on Albers’ teaching its true stature, since they belong to a properly analytic work, connected with the individual history of a subject. The assertion according to which artists couldn’t care less about meaning [signification] and pay heed, in what is nonetheless their work, only to the Pleasure Principle, needs to be modified in the case of Albers, despite the fact that the ruse I just mentioned itself tends towards an increase of pleasure. Albers’ teaching seems rather to confirm, a contrario, the link that can be traced in Freud between ‘meaning’ [signification] and the Reality Principle: a formal practice which excludes the condition of meaning [sens] would be bound to illusion [leurre], and, in the absence of the recourse representation offers, condemned to get wrecked on it. What we see is not what we see: [note 6] the well-known experiment in which two small rectangles of the same colour presented on different coloured backgrounds appear dissimilar suffices to show the gap which can exist between the physical fact of colour and its perceptual appearance, or, as Albers calls it, its ‘psychic effect’. That the respective tonalities of the two rectangles can, under certain conditions, appear ‘“incredibly” different’ [note 7] demonstrates the power of the effect of context when it comes to colour: a power comparable to that of the most effective ‘optical illusion’ [trompe l’œil] such that it is impossible to extract oneself from the deception [leurre] even when one is averted to it. But that would still amount to nothing if art, to believe Albers, did not begin precisely there, if art did not have its origin in the very discrepancy between the physical fact (‘reality’) and the effect designated as ‘psychic’. [note 8] Would painting have broken with representation only to amuse itself with illusionistic games [jeux illusionistes], perhaps pleasant, but strictly optical and without any grip on reality? This question would not get any really satisfactory response within the language of art criticism or art history. Does that mean that we ought to borrow that of psychoanalysis without further precautions (which would justify the reference to Freud’s text), or appeal directly, as Robert Le Ricolais would wish, to the language of topology? [note 9] That these two languages are not mutually exclusive, and that the ‘geometric intuition’ of which Poincaré speaks [note 10] is at work in both is demonstrated by the work of Lacan (which—has it been repeated often enough—makes a particular point of this proposition), as much as by the work of that unclassifiable character—not really an architect, not really an engineer—Le Ricolais. The attention given, in Le Ricolais’ terms, to that which happens on the side [note 11] should not, for all that, lead to depriving an œuvre like Albers’ of its characteristic property, testimony, as Mondrian’s was before, to a proposition no less peculiar than this very ‘geometric intuition’ advanced in the pictorial field. To convince oneself that the work of painting can borrow from operations of this kind, which cannot be thought only in strictly regional or ‘artistic’ terms, one need only consider the work the painters of the Renaissance achieved, in their time, under banner of perspective, and the shift which perspective produced in modern mathematics. One would be tempted to say that Albers’ project goes back to that of the perspectivists on one point, if the formulation—to take it literally—were not immediately open to question. 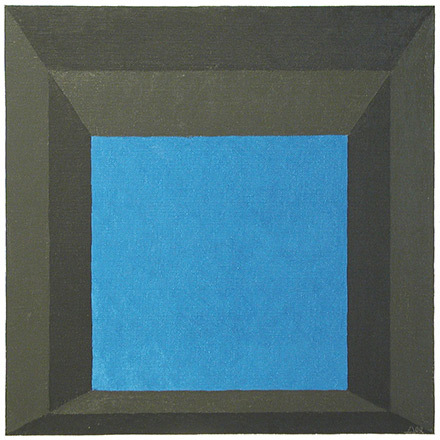 If it is correct to say that Albers’ art appeals directly to the subject, [note 12] the whole question remains as to the status assignable to such a ‘subject’, as much as to the conditions under which painting comes to implicate it in its game: the conditions which, for all that they are no longer those of linear perspective and of the point on which it depends as if on its ‘origin’, are part of it no less than they belong to a kind of geometry, albeit one which would have, as we will see, nothing punctual about it anymore, nor even, at the limit, anything linear. Figure 1: Josef Albers, Graphic Tectonic Drawing I, 1941. Pen and ink on wove graph paper ruled in blue, signed and dated lower right ‘Albers 41’, 43.2 x 55.9 cm. Bethany, CT: The Josef and Anni Albers Foundation. Copyright: The Josef and Anni Albers Foundation (1976.3.200). Even so, Albers tested the effects he aimed for in his work in the graphic domain [l’ordre graphique], consequently in linear mode, as well as in the field of colour [l’ordre chromatique]. To begin with the series Graphic Tectonic of 1942–44 [Fig. 1, above], which itself follows from some variations on what one mathematician—I am borrowing Pierre Rosenstiehl’s idea—would call ‘crazy plane curves’. [note 13] Far from being ‘crazy’, these abstract constructions, realised by means of closed lines, continuous or discontinuous, nested or, otherwise intersecting at right-angles, constituted as they are of horizontal and vertical segments of different thickness and whose configuration in ‘packets’ produce sometimes surprising surface- and volume effects, even in their simplicity—these constructions were controlled by an underlying constraining grid, as were, in the domain of colour, the Variants [1947–c. 1960] and, indeed, the series Homage to the Square [1950–1976, Fig. 2, top of page]: space, as Le Ricolais says, can present a variable typographic density, without having any less of an ordered structure. [note 14] The essential thing is that the controlled oscillation between the surface effects and three-dimensional effects, as between those of relief and of depth, is played out only in the two dimensions of the plane, the diagonal—by which, in perspective construction, the incidence of the third dimension is indicated—being never materialised, but only suggested. The diagonal (or the oblique, which is its image in perspective) intervenes on the other hand in the series Transformations of a Scheme [1949–53] as well as the Structural Constellations [c. 1950–60]—not to mention the Bi-Conjugates , which owe their method to painting—whose effectively bipolar configuration combines two apparently analogous motifs which one would say are constructed in axonometric perspective, but of which one seems to come forward and the other recede with an effect that presents itself like a fold or a flexure of space, though one cannot locate it exactly. This configuration, which makes the figure work in the very thickness of the plane, [note 15] while proposing, by means of a subtle displacement of lines, the best illustration of the concept of volume understood as transition [passage], under the influence of a kind of ‘crystallisation’, of the plane into space, [note 16] has the paradoxical effect of blocking the reflexive relation, itself bipolar, from which proceeds the privilege assigned to the classical ‘subject’ which would have it that my representations (even if they proceed from an illusion [leurre]) belong to me, because I perceive. [note 17] The recourse to the appearance of axonometric perspective, which escapes—even, as it is here, turned against itself—from the constraint of a point of origin, suffices to dissipate, at the price of a calculated figurative ambiguity, the equivocality which stems from the introduction in this context of the notion (in the last analysis grammatical) of the subject: neither the eye, nor the soul (to suppose as Descartes would, that it is the soul which ‘sees’, and not the eye) can master the oscillations and interferences, the transitions [passages] which are produced in the plane, and which are produced there in the sense of a Vorstellung, of a performance, with all the dramatic and sensory connotations which stick to it. Keine Welt hat kein Theater: there is no world—which is as good as to say there is no subject—without theatre. [note 18] All this is to measure the consequences and the implications—pictorial as much as philosophical—of representation being inscribed in the two dimensions of the plane, without the ability to overturn its constraints by appealing in one way or another to projection. In the plane thus unconstrained by a point designated as ‘origin’, and thus given over to its own activity and dynamic, the actors that are the figures or volumes are susceptible of losing or changing their identity as well as their positions. So it goes too, in the field of colour: the phenomena that Albers studied under the rubric of the interaction of colour—such as the variations of identity, value or chromatic intensity under the influence of context, the effects of contour, transparency, folding, intersection or superposition, indeed of weaving (such that a colour appears to pass over or below another like the threads of taffeta)—which are produced in the plane (and in its thickness) simply from the juxtaposition of coloured patches—to say nothing of the recession or pushing forward of colours with which the series Homage to the Square [note 19] plays systematically: all these phenomena or effects clearly make no sense unless connected with the experience of a subject: concrete, subjective experience one would be tempted to account for in psycho-physiological terms [note 20] if such an approach would not lead, necessarily, there again, to obliterating what I called the activity of the plane, while masking [faisant écran à] the function which might be that of illusion [leurre] (if that is the right word) in the elaboration of new forms of writing. A writing essentially transitive in its operation, in that it plays at the junction of several supposedly heterogeneous fields which borrow a semblance of common measure from it. At their limit, the experiments Albers conducted on colour escaped the constraints of linearity, as his graphic experiments escaped those of the point. In contrast with the paper cut-outs of Matisse, which are, according to the painter, a way of drawing in colour—the work of marquetry, albeit fake marquetry—what Albers’ painting leads to, as much as the work he imposed on his students, is putting into play forms (a square, perhaps) so simple, so elementary, so ‘weak’ that thinking in colours [la raison de la couleur] carried it, in the event, over to thinking in lines (to the point, as has been said, that an appearance of a contour can emerge, can produce itself, at the junction of two coloured patches—the contour, to which, as Alberti would have it, colour owes its thinking [raison]). The reference to marquetry is decisive here, not so much for the analogy it suggests with the work of perspective, but because it forces the abandonment, as Wittgenstein clearly saw, of the atomistic conception of colour: [note 21] colour does not in any case lead to units identifiable as such outside the context in which they occur; it’s a matter of a language game from which proceeds the idea of a grammar, or a logic, indeed of a geometry of colour (in the Wittgensteinian sense); [note 22] or, it’s a matter of the experiments with chromatic interaction Albers proposed to his students and to which his own painting gives a properly aesthetic scope, but whose heuristic component is no less evident. But this would count for nothing if Albers’ pictorial practice had not led him, by a kind of necessity, following the internal logic of the very work of painting, to recognise the properly scriptural dimension of colour: the idea that the distance, indeed, the interval between colours can be expressed in terms of limit, which is nothing but another form of spacing, a transformed spacing, and spacing, in turn, another form of limit, something like an ‘extended’ limit, whose effect could be translated into a diagram; the hypothesis according to which the eminently geometric operation of displacement provides a good instrument to measure the difference between colours; [note 26] the recurrent analogy between colour-space [l’espace chromatique] and the link, duly noted, between colour and extension [note 27] (even if the philosophers have the tendency to define it in intensive terms [note 28]): these traits, among many others, allow us to glimpse what might be not simply a colourful writing, but one which would borrow directly from colour, from its geometry as well as its economy. The ‘pressure’ [poussée] [note 29] of colour, and the ‘constancy’ of this pressure, the interaction between colours thought in terms of excitation and inhibition, suffice to justify the displacement towards analysis in terms of drives that the reference to psychoanalysis called up at the start, as well as the idea, dear to Albers, of a Gestaltungstrieb, [note 30] a form drive, or better said, a formation drive, an information drive: with this small reservation, again, that such a displacement, be it metaphoric, would only make sense—as follows from the idea of writing, if not also from the idea of space—with regard to the plane in which it is inscribed and where it thinks [a sa raison], in the register of the concept or in the register of representation. Figure 3: Josef Albers, Two Structural Constellations, 1959. 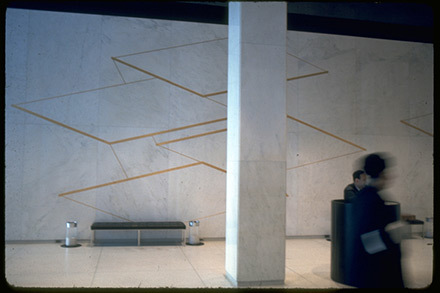 Incised gold leaf on white Vermont marble, 488 x 1,859 cm. New York: Corning Glass Building, 717 Fifth Avenue. Copyright: The Josef and Anni Albers Foundation. Figure 4: Josef Albers, Homage to the Square: Somber Promise I, 1969. Oil on Masonite, signed and dated lower right ‘A69’, 61 x 61 cm. New Haven, CT: Yale University Art Gallery. 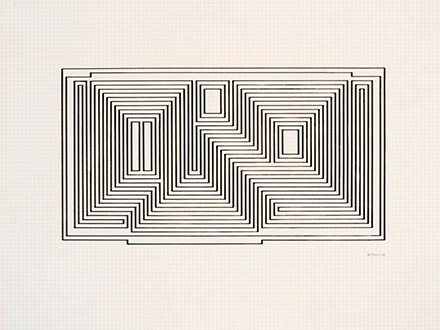 Copyright: The Josef and Anni Albers Foundation (1976.1.615).